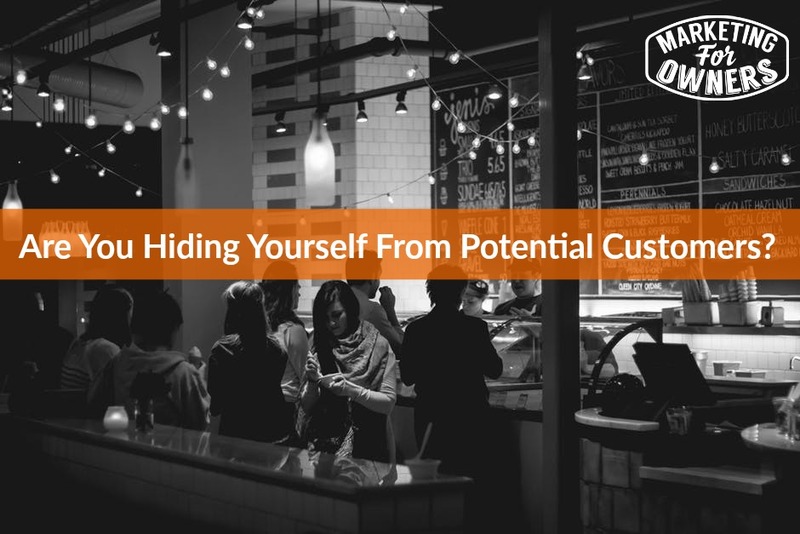 Are you hiding yourself from potential customers? What I mean is that people will want to contact you if you got something good to say. Hopefully you have. Or if you’ve got something good, a service, a product, whatever information. That’s what it is all about this day. These days you got to make people want it, and then you got to make it easy to contact you. So by hiding away, are you making it difficult? Alright so I am talking about your website for example. Is your website make, is it easy for people to find out a way around and get that information for you. Is it all there? Are you able to update your website? If not, again go back to the Owners Club. We teach you step by step and by that click by click, in how to make a, put a website together that you can update? That is professional and costs less than a hundred dollars? Yeah. So don’t tell your web designer because they don’t know what they’re doing unfortunately, and just one thing they are trying to design websites for you. Or as an actual fact, your website is for the user, not for you. It’s not about you. It’s about them. So it’s not their fault really. They don’t know. But your website needs easy, needs things like phone numbers, needs things like addresses, it needs things like a contact form, and email addresses. Some people think that by being online you don’t need to give that information. Well yeah, when you’re online they trust you less than if they can meet you in real life. So yes they want to know you exist. No they are not going to come round. They are not going to drive 500 miles and come and knock on your door. My home address is readily available online. Nobody and I am everywhere because I’m on the podcast and everything. I have never ever had anyone come round and knock on my door. Have actually met a couple of people, just as a side, I was once at a meeting and someone standing there in a group we’re talking to. Somebody said ‘I recognize your voice.’ And he heard my podcast, he asked what my name was, he listens to my podcast, recognized me from there. Cool eh? There you go. So things like emails. On your emails when you say to people, callers. Do you give them the phone number or do you want them to go off to your website. Look it up, then try and find your phone number. Make it easy. If you ever say to someone, callers, write the phone number there. And when it comes up on a mobile, if they’re looking on mobile, they can just press the number and call you instantly. We are very lazy. On your website, if you are going to say contact us or call you, contact us, make that link to your contact form. Don’t say on via the contact page, don’t think oh they can just get it. If you say post it to us, put the address right there at the time. Don’t make it hard. Don’t hide. If you are sending out a quotation to somebody, do not hide the price down at the end. Be brave. Stick it in the beginning. And then explain why it’s so low. And why the value is there. But then if you say, ring callers, put the phone number there. Don’t make them go through Find yourself papers and sheet it’s at the top of the sheet. It may be at the top of the page. Why can’t you make it easier? Email us. Email me, email me, Jon@, Jon@MarketingforOwners.com. That kind of thing. Make it easy. In letters to people. Again add this kind of stuff. If it’s, where it’s appropriate. Of course don’t add it if no one’s going to contact you. If you phone somebody, explain how they can contact you, and spell it out. So many people are shy, embarrassed. They may not be able to quite hear you. They may not get your accent or something like that. So spell it out. So for instance, my name is Jon and its spelt J-O-N. If I just said its Jon@MarketingforOwners, people would put JOHN@ and it probably wouldn’t get to me. Well actually, I don’t know, it might do. But I will spell it out. I’m not going to find out. That’s the sensible thing. How about voice mail? Do you leave voice mail on your iPhone, your android, on your, people still don’t answer phones. That kind of thing. Do you say when you’re, that you’re away, when you’ll be back or are you thinking, ‘Oh gosh they’ll go around and burglar my house.’ No they won’t. Oh well, they might do, of course I didn’t say they won’t. But what I mean is tell them how else to contact you. Tell them they can email you. Then spell out your email address. You can even repeat it to save them how. Replaying that message because as you start to spell it, they’re scrambling around for a pen. And you know how it is, you get the pen just as the guy finishes. Say it again. Because I don’t want to go back and play that again. I might not, and then you won’t hear from me and then you won’t get my money. How about text messages? If you text people, do you say, who you are? And how they can call you? Or something like that. All this thing. Any way a customer can contact you, Make it easy, make it really easy. Another one about hiding. This kills me. On your website, your about us page. Does it actually say about you? Say you are a golf course management company. Under your About us page, does it say something like, ‘Hello, at Golf Course Managements we manage golf courses. We’ve been established for so many years. We come to you. We have a range of products and services and…’ because that’s not what they wanted. That annoys the heck out of them. Not just me. They want to know who you are. Why you’re around. It’s about you. What, you’d stick on your LinkedIn. Not when you went to school and everything. You can say, ‘Hi, my name is Jon, and the founder of Golf Course Management. Back in 1972, I was frustrated with etc., etc. and I had to do it. So I got together with my buddy. We… etc.’ tell them about. ‘And here’s a picture of me. Here’s them. You can contact me at via my personal twitter. The company’s social media is…’ all that about us. And finally, if you’re out and about, and you’re not around. Please again make it easy. Use a messaging service. These days they are easier. Get a premium phone number. In the UK, get an 800 or get a local, an O333 and one of these modern ones O 3 4 5 or whatever they are. Can’t remember, but just get a simple number so that you look professional. They don’t cost much. If you don’t know how to get them, google it. Use a messaging company. I use money penny in the UK. There is an international one that’s great, called Grasshopper. Fantastic. And there are many. Use things like that. These people will answer the phone for you. When you’re a builder or you’re contractor, whatever you are out on the site. And you’re mixing concrete or you’re in the middle of that and the phone rings. You don’t want to drop it and you don’t want to go, ‘oh hang on a second mate, yeah.’ No these people will answer it for you. And they will text you if it’s urgent, or pass the message on. They do this for a living. It is what they do. Seriously. You should be trying these kinds of things. Quickly Book for the Week. It is by Richard Koch. He is great. The guy is genius. He is the guy behind the 80-20 rule. I mean obviously Pareto is guy behind it but you know what I mean. If you’ve heard of the 80-20, that’s him. 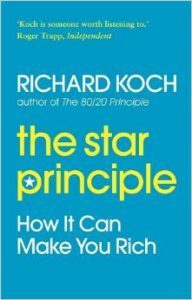 This is called though ‘The Star Principle’. 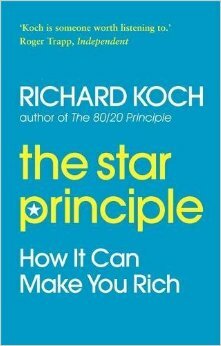 Read his book ‘The Star Principle’. It will explain… he explains how he finds companies to invest in and makes a pile of money. But what to look for. But also how to grow a company and then he’ll invest in you. But it will explain. I learned things for my business that changed the whole direction. Brilliant. Do it. Great book. I’ll be back tomorrow.